Unai Emery lost for the fifteenth time in 21 games against Real Madrid. A defeat, although less painful than the 6-1 of the Camp Nou, is also very difficult to explain and assimilate. Among other reasons because his PSG, like every team aspiring to the throne, offered great moments of football and put the champion up against the ropes, cornered it. However, this team, which has amazed in the league with 25 goals, got dry at the worst moment. The horizon of the quarterfinals, never crossed in five precedents, moved away again for Emery, who in the coming weeks will continue to remember his commitment to Meunier at a time where Di Maria could have shattered Real Madrid. The nine goals and five assists in the last 12 appearances of El Fideo were not enough this time. With almost half an hour ahead, the game, according to Emery, asked Alves more as an interior, the same position where he already taught last year in Turin. The tactical variant brought good minutes of the PSG, since Alves began to build a lot of game in the rival field. In addition, it also focused Mbappé's position, closer to Neymar and, therefore, with more options for combination and imbalance. In fact, Varane and Ramos had to intervene urgently before three magnificent chances for the visitors. Then, Zidane bet very hard with Asensio and Lucas Vázquez and the game turned completely, paradoxically for the flank defended by Meunier. The move that cost the game. After maintaining his usual plan of 4-3-3, and overcoming the rigors of Zidane's high pressure, after the 0-1 that opened the doors to his lethal counterattack, the hard reality of 3-1 went over Emery. So in the press room, he chose to blame Gianluca Rocchi. "The referee has clearly favored them at key moments, both in fouls, as in cards," he assured behind the microphones. «What happened in the game has not been reflected in the score. It is a bad result, although not deserved. However, I have a lot of confidence in the team and we are going to make Madrid suffer, "he predicted on the return of March 6 at the Parc des Princes. 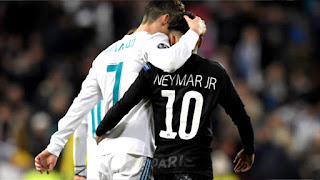 There, Zidane must throw the tie to Neymar and Mbappé, two monsters capable by themselves of any massacre. The Brazilian, author of the subtle assistance for the 0-1, showed the character of those called for glory. After five minutes he had already been intercepted by Casemiro, Isco and Nacho. Illegally, of course. Not even the admonition to the quarter of an hour disturbed his mood. Attached to the left side, associating with Verratti or Rabiot, he deployed a whole range of solutions and skills. In fact, their diagonals after the break could only be improved by Leo Messi. On the other side, to misfortune for Ramos, Mbappé simply burned the grass. He did not get everything he tried, but his ability to intimidate and his stride brought the echoes of that first Ronaldo Nazario. Nevertheless, it was not enough. Emery and Neymar were the main focus of PSG’s fans disappointment. Put in Rabiot’s own words: "We always say the same things, we always do the same things, and in the end, we are always floored in the same way. It's all well and good putting eight goals past Dijon, but it's in matches like this that you have to stand up and be counted. It is very frustrating we let the match slip out of our hands in the end." No need to say more. PSG is yet to prove it can perform as due in the defining moments. Neymar is yet to prove he left Barcelona for good.